When Andrea Rosen, the new curator of UVM's Fleming Museum of Art, was growing up in New York City, she and her family would pilgrimage to the annual convention of the International Guild of Miniature Artisans. Before returning home, she and her sister would be allowed to purchase one or two treasures made by exhibitors. These things, Rosen says, still make her happy whenever she sees them on the dresser in her mother's home: a dish of Purina dog food, a music book, a pack of M&M's, all of which could easily fit in the palm of her hand. Rosen related this early memory to a small but invested audience during her March 2 lunchtime lecture, "Small Worlds: Miniatures From the Fleming Collection." The main point of her introductory anecdote was not that small versions of life-size things are inherently fascinating (they are! they are! ), but rather that exhibitions of art and artifacts often have personal origins. As a studio art undergraduate at Smith College, Rosen said, she constructed tiny versions of famous artworks by the likes of Marcel Duchamp, Eva Hesse and Rene Magritte. Now stationed at the Fleming, Rosen has been getting an intimate look at the museum's permanent collection. ("How does someone get to know a collection of 25,000 objects?" she asked, and then answered: "You walk through art storage spaces. Then you do it again, and again and again.") 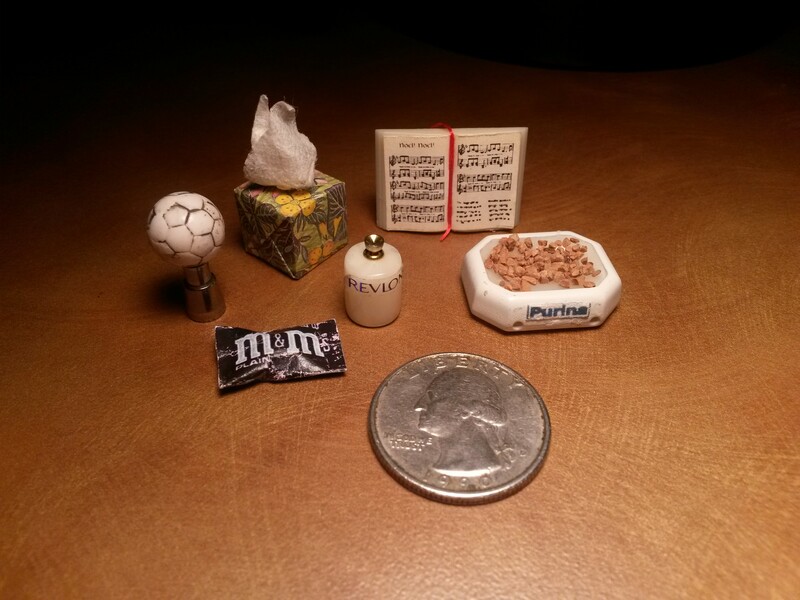 During her rummaging expeditions, Rosen said she was struck by the crosscultural presence of miniatures. She called it a "global phenomenon — and probably an instinctual one at that." Incense Burner in the Shape of a House, Japan, 20th century. Brass. Fleming Museum of Art, 2003.4.358 LA. Rosen's finds to date include a set of Japanese lacquerware housewares, a pre-Colombian vessel lid with a dog figure, a variety of building and transportation models, and an Egyptian amulet that was once wrapped within in a mummy's bandages. 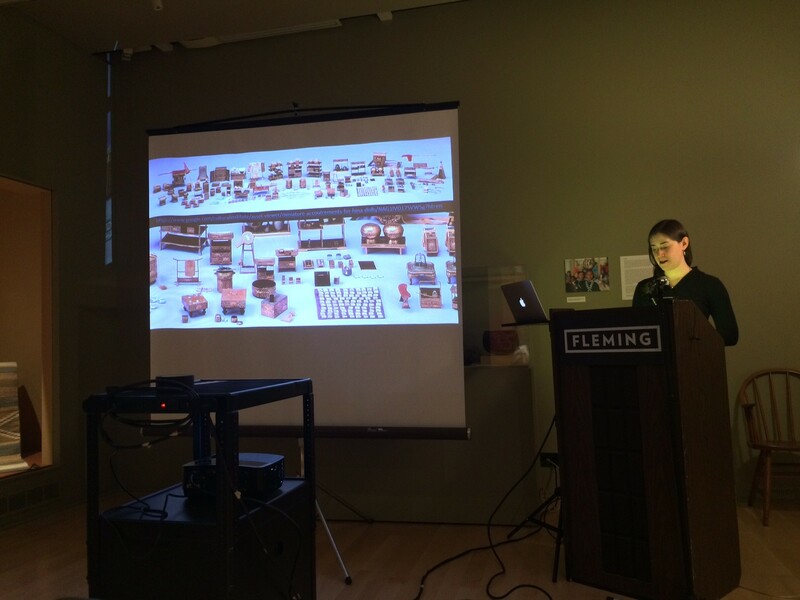 As she discussed each of these, the curator's excitement about the objects — and her research process — was infectious. 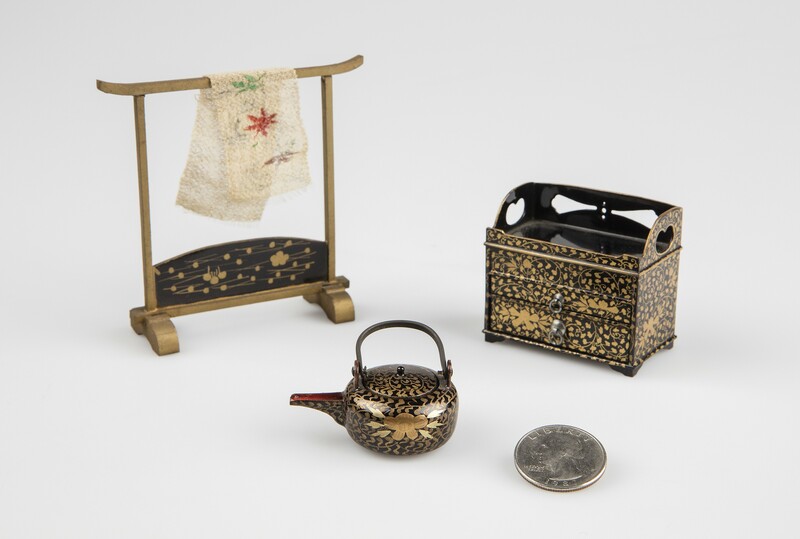 Rosen earned bonus points for incorporating a time hook into her talk: As it turns out, the Japanese lacquerware pieces are most likely part of the country's Girls' Day, also known as Doll's Day or Hinamatsuri, which is celebrated every March 3. Modeled after housewares that are typically included in the dowries of wealthy women, the miniatures are placed on the bottom tiers of an altar-like construction made to celebrate a girl or young woman. "Happy Hinamatsuri, everyone!" Rosen said with a laugh. She closed by emphasizing that curation is a process. Far from identifying as experts, she said, curators have an intellectual itch to scratch, and an exhibition emerges as the result of the discovery process. "Curiosity is one of the most important parts of being a curator," she said. 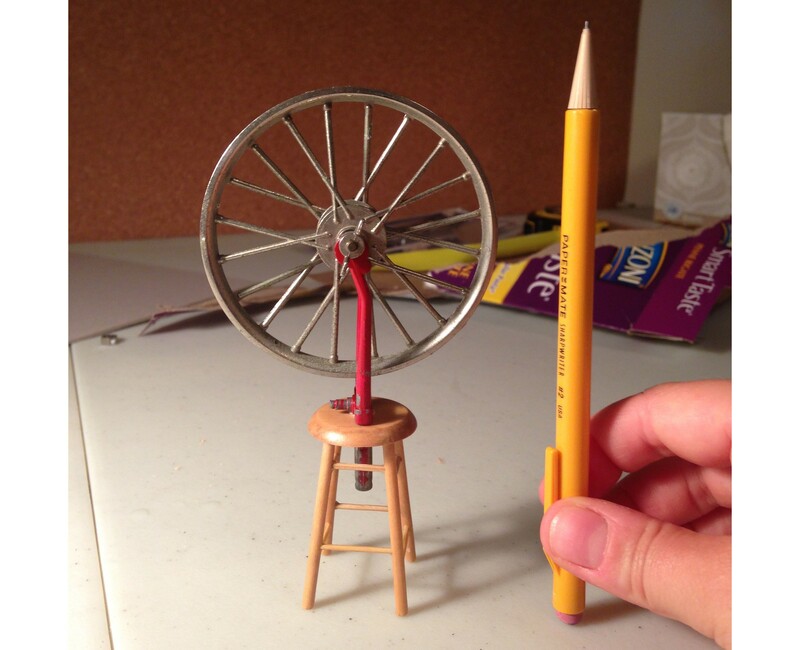 As for Rosen's miniature exhibition, fans of the teeny-tiny will have to wait patiently; it 's tentatively scheduled for spring 2018. She also hopes to develop an exhibition featuring work by contemporary artists who make and/or use miniatures, including Xing Danwen, Charles LeDray, Joe Fig, Charles Simonds and Laurie Simmons.